A State Belt Railroad locomotive waits while cargo is unloaded onto a ship bound for China. As of its incorporation in 1850, San Franciso's waterfront had many commercial wharves, but the natural profile of the shoreline was steep and jagged, making it difficult to access by both land and sea. In 1863 the Board of State Harbor Commisioners set about bringing a more consistent shoreline to the San Francisco waterfront via the construction of a seawall, which eventually created the smooth, flat contour of today's Embarcadero. 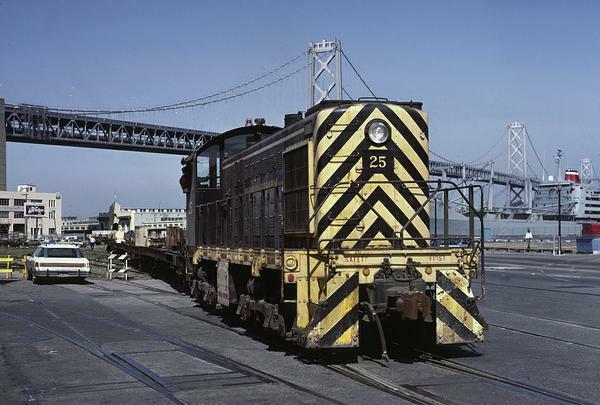 The State Belt Railroad was founded in 1889 to connect the wharves of the Port of San Francisco with several regional railroads including the Western Pacific, the Santa Fe, and the Northwestern Pacific Railroads. Initially the State Belt had no direct rail connection to any other railroad, with freight cars instead being shipped by ferry barges launched from loading slips at Fisherman's Wharf. Several of the port's piers still sport SBRR rails, though most are only visible behind locked gates and fences. The State Belt would see its first direct rail connection much later, when in 1913 the Southern Pacific Railroad, using the right of way now used by the Caltrain commuter rail service, connected with the port's rail line via an interchange at 3rd and King streets. At its peak, the State Belt railroad had tracks spanning all the way from Crissy Field to China Basin, providing freight rail service to the military facilities in the Presidio and at Fort Mason as well as delivering materials needed for the construction of the 1915 Panama-Pacific World's Fair in what we now know as the Marina District. The move to container shipping on large barges led to a migration of port business to the Port of Oakland, and the State Belt's railroad operations began to wind down. Because the city's sea wall had extended the shoreline beyond what existed at the time of the city's incorporation, the Port had always been directly owned by the State of California, but in 1969 the Port and its railroad were transferred to City ownership and the railroad became known as the San Francisco Belt Railroad. 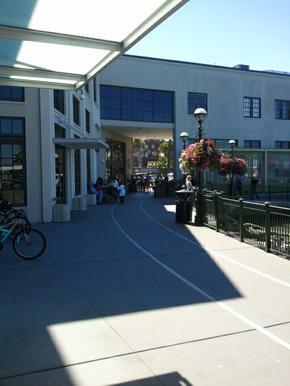 This former track onto pier 3 is now a locomotive-sized pedestrian access for the public shore, several restaurants, and the boarding area for a cruise ship company. The Embarcadero has seen two major redevelopments since the heyday of the Belt Railroad, first with the development of the double-deck Embarcadero freeway along a large portion of the shoreline, and then later with its destruction and the creation of the tree-lined boulevard we know as the Embarcadero today. As a consequence of these large development projects, little evidence of the former railroad remains in plain sight to those walking the San Francisco Bay Trail between the Ferry Building and Fisherman's Wharf, but small reminders persist to those who pay close attention. Several small parking lots occupy oddly-shaped blocks that skirt the inner curve of The Embarcadero, betraying the location of former storage yards and other facilities that supported the railroad. More conspicuous is the office building inside the elbow of Sansome St and the Embarcadero which began its life as the State Belt's car roundhouse, where cosmetic rails have been retained in its forecourt to commemorate its earlier pupose. Moving west, the evidence is more pronounced: the exposed rails still present in the pavement around Aquatic Park lead to the tunnel constructed under Fort Mason Park. 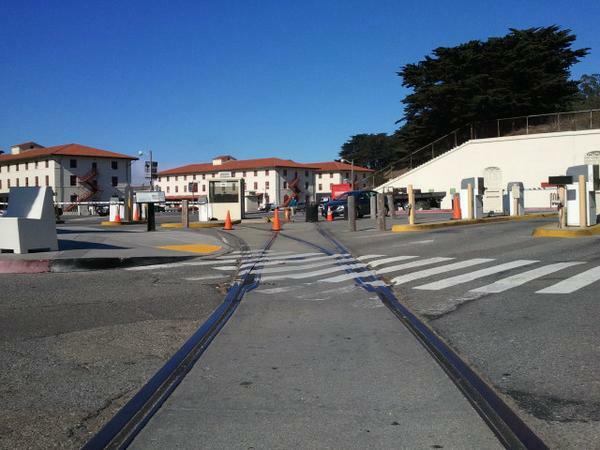 Despite efforts to pave over the tracks on the pathway just south of Marina Green, wear and tear has revealed the path that trains formerly took to reach Crissy Field and serve The Presidio. 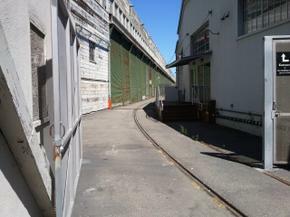 Tracks remain proud at Fort Mason, from its entrance and through the parking lot to the piers beyond. The railroad closed completely in 1993, after 20 years of operation by Kyle Railways under contract to the City. Several former State Belt locomotives can be seen in the collection at the Golden Gate Railway Museum in Hunter's Point, and the Muni Metro and historic streetcar service on The Embarcadero are ensuring that there will be rails of one form or another on The Embarcadero for years to come.